Large Party Beverage Tub Yellow by Creative Bath at Verve Wine Bar. MPN: PTUB-BY. Hurry! Limited time offer. Offer valid only while supplies last. 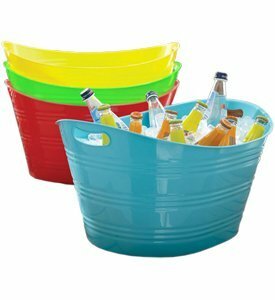 8 GALLON PARTY TUB 8 GALLON PLASTIC PARTY TUB-Keep beer, wine, coolers, water or soda ice cold and easily accessible during summer outdoor parties. Comes in four colors green blue yellow and red. Perfect for graduation birthday holiday or New Years parties. Use it for extra storage space when its not in use as a beverage tub. Perfect for storing not often used items like stuffed animals toys cleaning supplies or blankets. If you have any questions about this product by Creative Bath, contact us by completing and submitting the form below. If you are looking for a specif part number, please include it with your message.